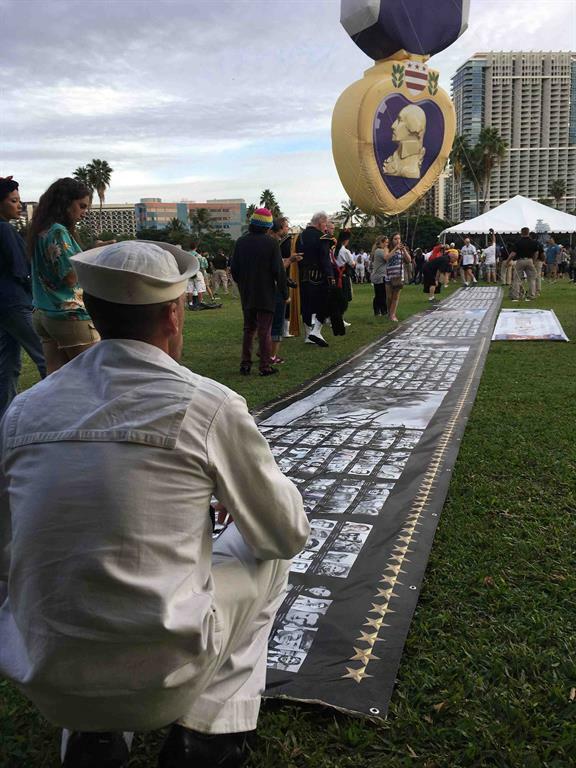 The Spirit of '45 coalition supported the Pearl Harbor 75th Anniversary Commemoration by creating a 100 ft "Wall of Honor" comprised of the photos of the 2,225 Americans who lost their lives during the attacks of the December 7, 1941 - the largest collection of photos of the Gold Stars of Pearl Harbor ever assembled. 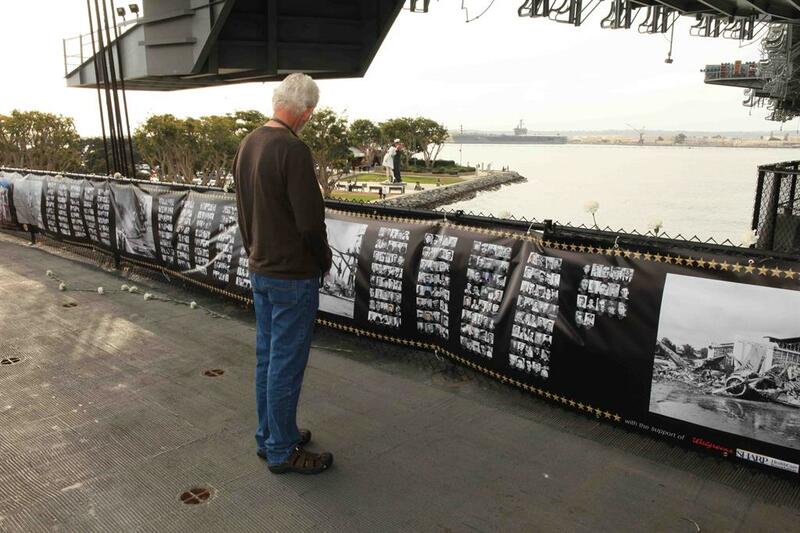 The Wall was designed by Nick Molle' of the Digital Clubhouse Network and was co-sponsored by A+E HISTORY and Walgreens, with support from the USS Midway, Dignity Memorial and Sharp Memorial Hospital of San Diego. 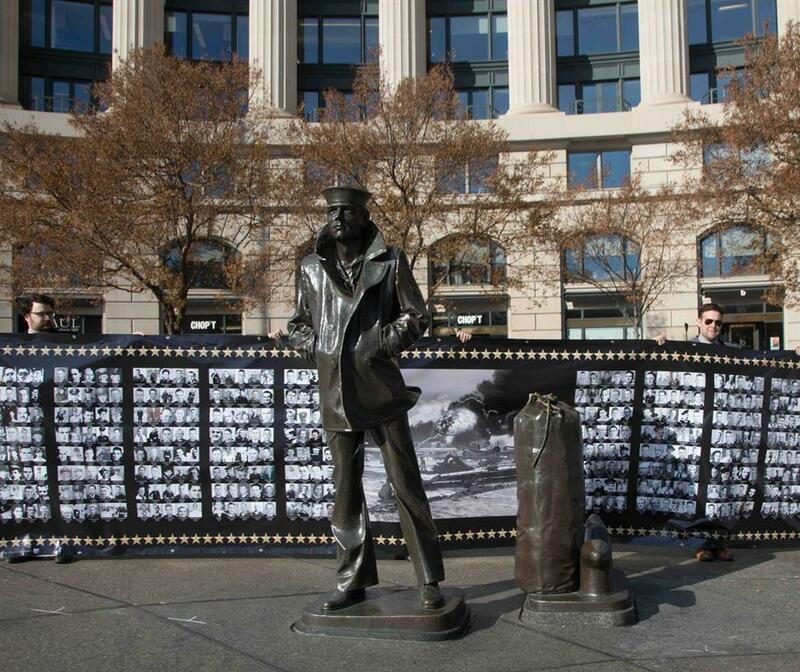 Replicas of the Wall were displayed at the US Navy Memorial in Washington, DC, the USS Midway in San Diego, at the Oak Hill Funeral Home & Memorial Park in San Jose, CA, and in New York City in what will be a new annual Spirit of '45 tradition on Pearl Harbor Day. 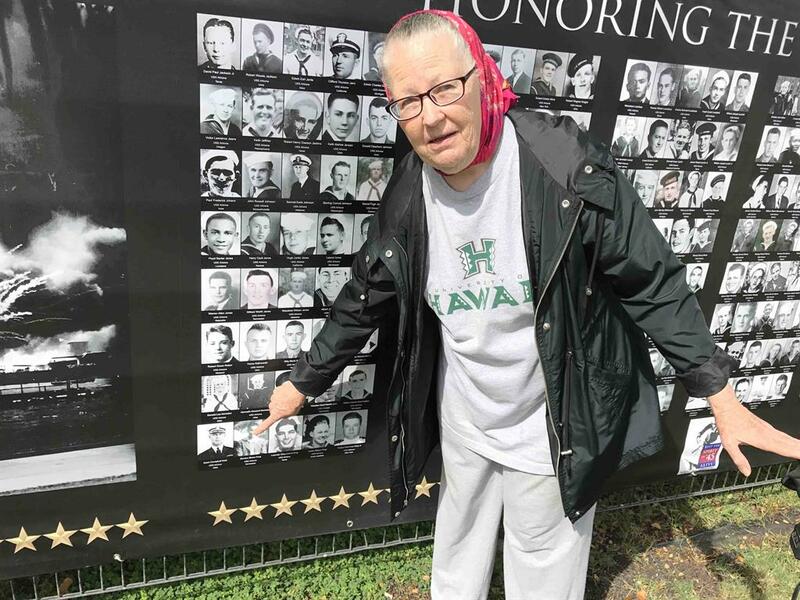 The Pearl Harbor Gold Stars will be the first photos to be officially "inducted" into the giant Spirit of '45 WWII Wall of Honor that is being built in time for the 75th anniversary of the end of WWII in August 2020. 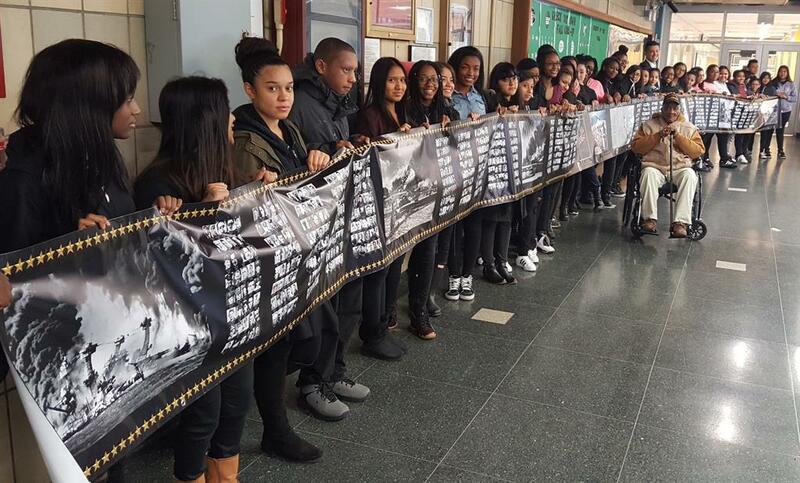 We're Building a Wall of Courage and Unity! 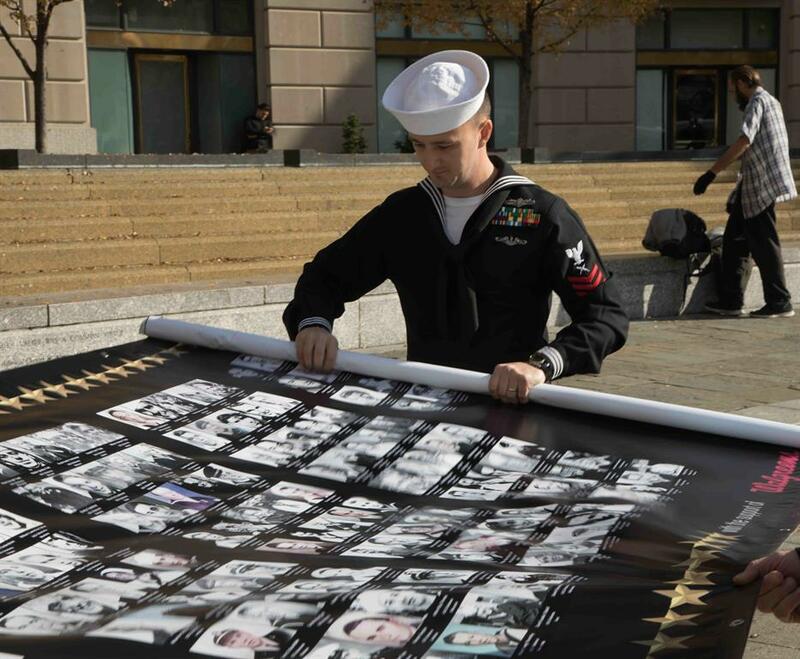 The Wall of Gold Stars was presented to the U.S. Navy and the National Park Services by Pearl Harbor Survivors Stu Hedley of San Diego, and Carl E. Clark of Menlo Park, CA. 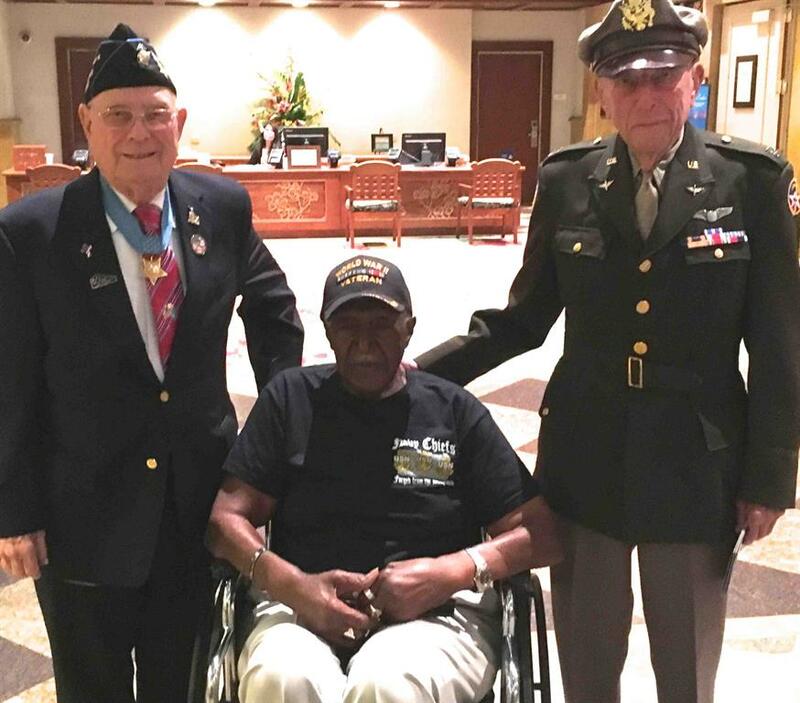 Pearl Harbor Survivor Stu Hedley (L) and Carl E. Clark, were joined by Spirit of '45 spokesmen Congressional Medal of Honor recipient Hershel "Woody" Williams and Capt. Jerry Yellin as special VIP guests of Pearl Harbor 75th Anniversary Commemoration Committee at gala held at the Hilton Hawaiian Village on the evening of December 6, 2016. 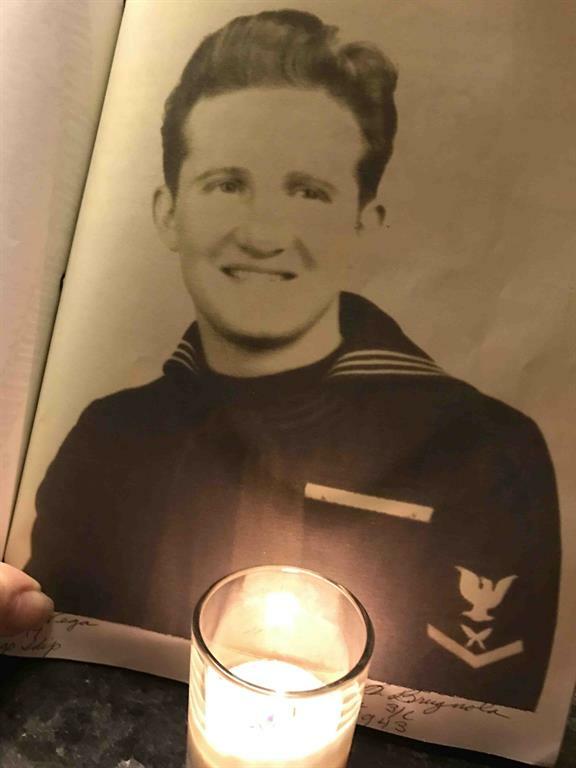 Mr. Hedley was on the USS West Virginia when it was attacked by Japanese dive bombers, and later served in several major naval battles of WWII, including Wake Island, Guadalcanal, and Saipan. 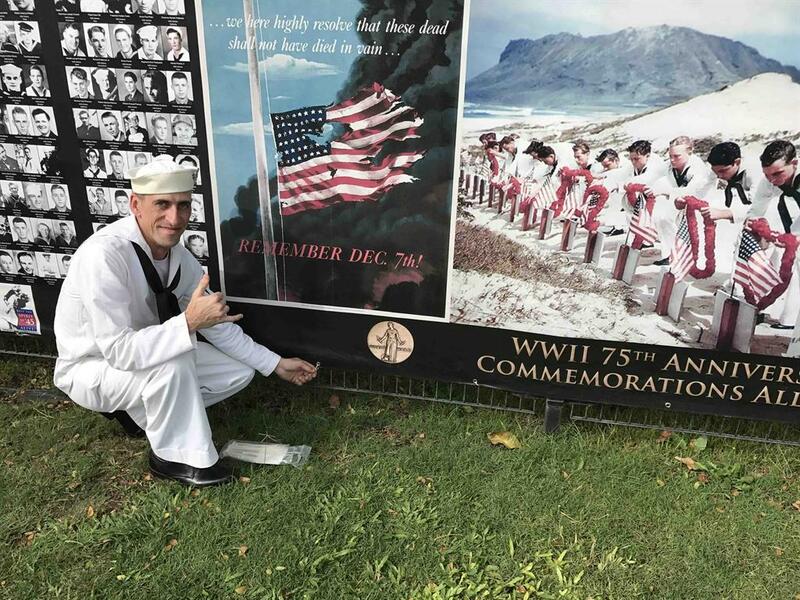 Mr. Clark was a WWII Navy veteran who was serving at Kaneohe Base during the December 7 attacks, and later saw combat in the Pacific theater, including the final battle of Okinawa. Wall displayed at Pearl Harbor Visitors Center. Roy Emory and Faye Hopkins-Boore point to the photo of their uncle who was killed when the USS Oklahoma was hit. NBC filming news segment. Mary Caldera points to photo of loved one who was killed during the December 7 attacks. Chris Texerira helped hang the Wall. Park Ranger Dan Brown and Warren Hegg who led the project. 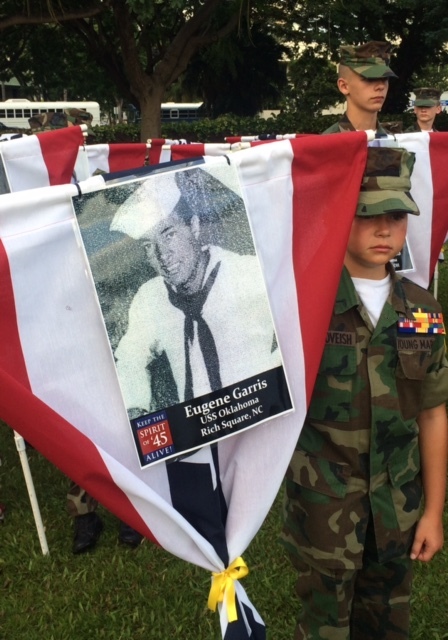 Hundreds of the photos were carried by young volunteers in the Pearl Harbor Day Parade, which has become another Spirit of '45 annual tradition. 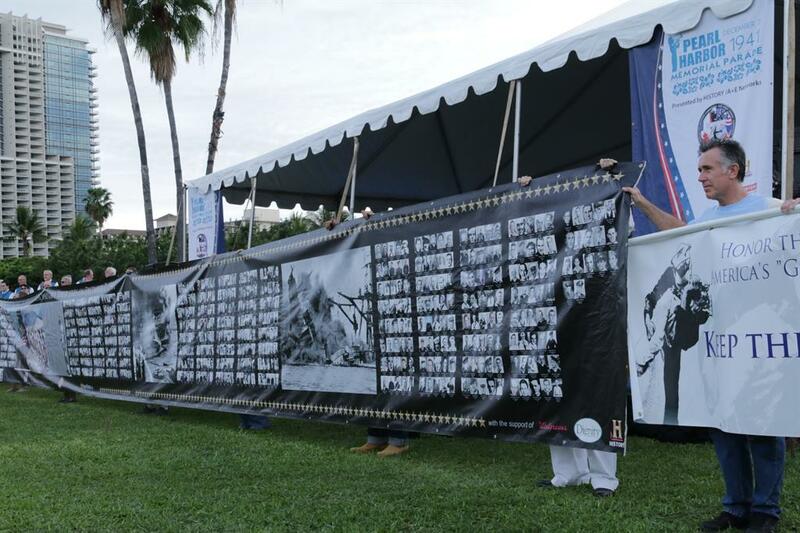 "Borthwick Mortunary and Hawaiian Memorial Park Cemetery (Dignity Memorial) was proud to be a sponsor of the Wall of Honor in Hawaii. It is important for us to recognize and honor the men and women of WWII for their courage and unyielding commitment to our country. We are grateful for our heroes and we must preserve their legacy so that their selfless sacrifice is not forgotten." 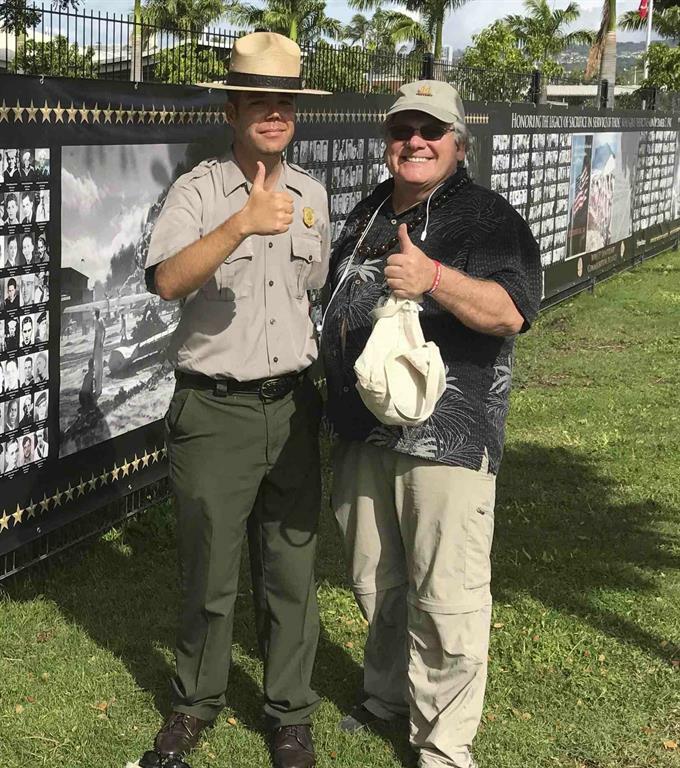 Jay Morford, President, Hawaiian Life Plan, Ltd.
(L) Pearl Harbor Survivor Carl E. Clark of Menlo Park, CA, with Enna Anulau of Dignity Memorial which helped sponsor the Wall with Walgreens Hawaii. Carl's trip to Hawaii was made possible by generous donations from U.S. Congresswoman Anna Eshoo and California Assemblyman Kansen Chu and his wife Daisy. 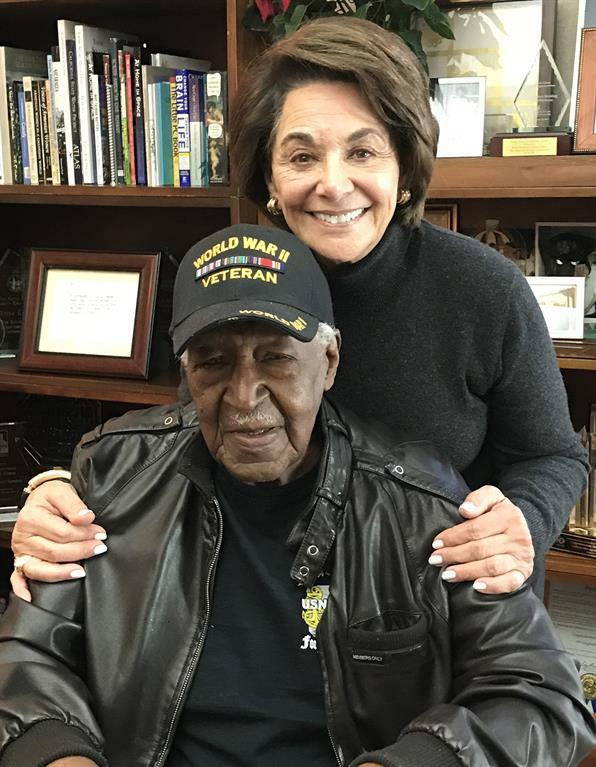 Just over two months after his return from Hawaii where he represented Spirit of '45 Day at the Pearl Harbor 75th Anniversary Commemoration events in December 2016, Carl E. Clark passed away peacefully on March 16, 2017 at the age of 100. "Carl Clark is a true American hero. 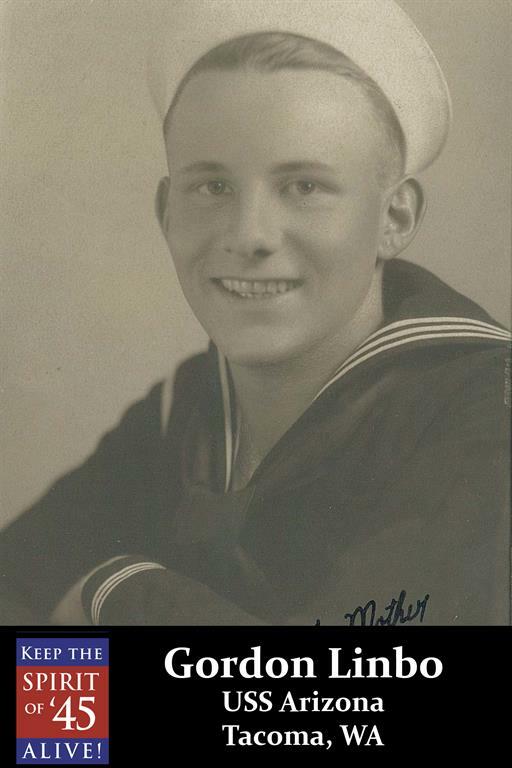 Because of his courage, he saved the lives of many of his fellow shipmates and the USS Aaron Ward over 71 years ago. His extraordinary service to our country never wavered, despite his being subjected to segregation and racism. His unwavering patriotism is part of the rich history of our nation. How fitting for him to be able to share his important life experience at the Pearl Harbor 75th Anniversary Commemoration." 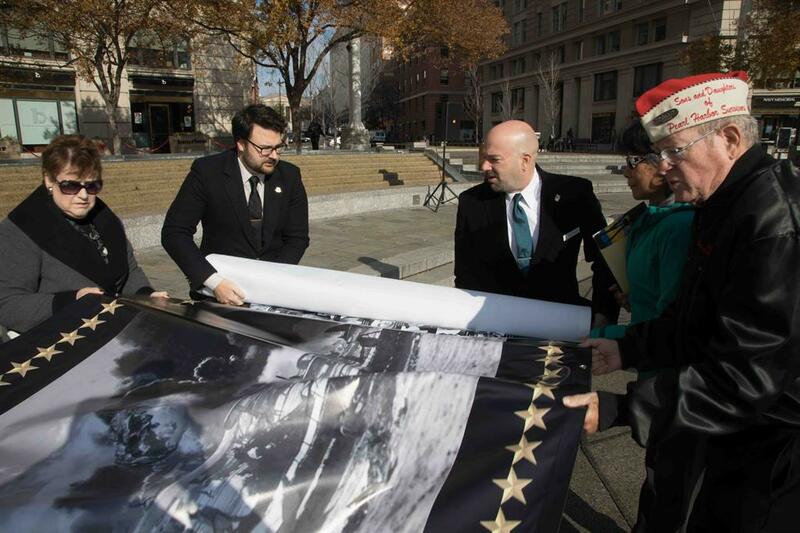 "I am proud to have had the honor of helping support Mr. Carl E. Clark's participation in the Pearl Harbor 75th Anniversary Commemoration on behalf of our community. Mr. Clark represents the "unsung heroes" of his generation and the tradition of selfless service to our country this is one of the cornerstones of America's greatness as a nation." 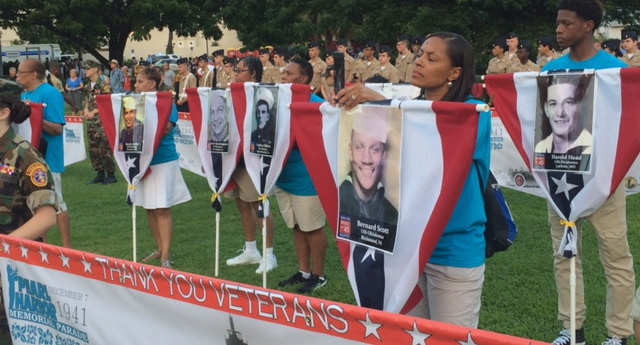 The Pearl Harbor Wall of Gold Stars was displayed at several locations in Hawaii during the 10 day 75th Anniversary Commemoration, including the special gala at the Hilton Hawaiian Village, the Pearl Harbor Visitors Center, and during the opening ceremonies of the National Pearl Harbor Day Parade, which featured a Spirit of '45 Day entry. "I usually have the same summation when telling about this fateful event: 'All gave some; some gave all.' There are only two people who will give their life for you: Jesus and a military man. The real heroes are still out there." Wall of Pearl Harbor Gold Stars displayed at USS Midway with Seward Johnson's sculpture depicting the famous "Times Square Kiss" symbolizing Spirit of '45 Day that stands in San Diego's Greatest Generation Park. (C) Walgreens District 263 Manager Lance Zwanck. 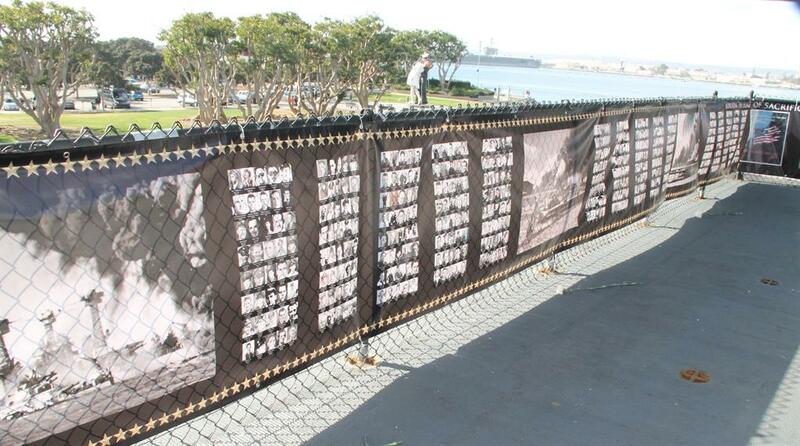 (R) Spirit of '45 Day national events coordinator Linda Laurie with the San Diego Wall that was co-sponsored by the Midway, Walgreens, Sharp Memorial Hospital, A&E HISTORY, and Dignity Memorial. "The seventy-five years following Pearl Harbor have not, by any measure, dimmed the legacy or contributions of the Greatest Generation. The celebration aboard the USS Midway Museum, in conjunction with Spirit of '45 and many partners, bears testimony to America's continuing devotion to preserving the American spirit of service to country and community." 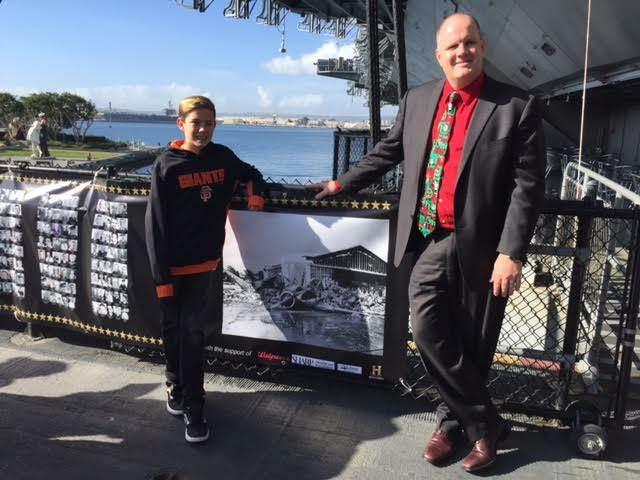 "Sharp HealthCare Foundation is proud to sponsor the Pearl Harbor Wall of Honor. San Diego is home to Sharp HealthCare, where we proudly serve the veterans who fought for our freedoms, and equally proud that many Sharp employees and affiliated physicians are veterans. As we honor those who lost their lives at Pearl Harbor, we also remember our namesake, Lt. Donald N. Sharp, who gave his life for his country in World War II." For more photos of the Pearl Harbor 75th anniversary commemoration on the USS Midway Museum, click here. Rev. James Blakely, US Navy veteran who served on the USS St. Louis during the attacks on Pearl Harbor, with Navy Jr. ROTC cadets in New York City. 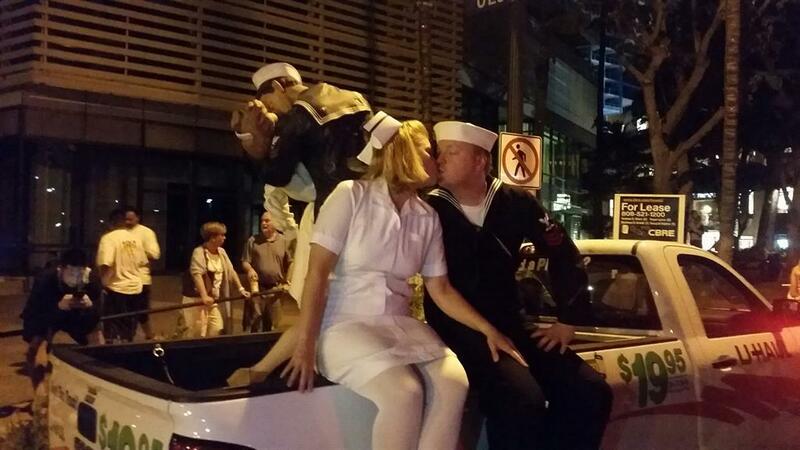 For the second year, the nation's largest Pearl Harbor Day parade featured a Spirit of '45 Day entry, complete with a life sized version of Seward Johnson's sculpture depicting the famous "Times Square Kiss" that is on loan to the USS Missouri, and Kiss re-enactors Theresa Werner and James Martin from Washington, DC. 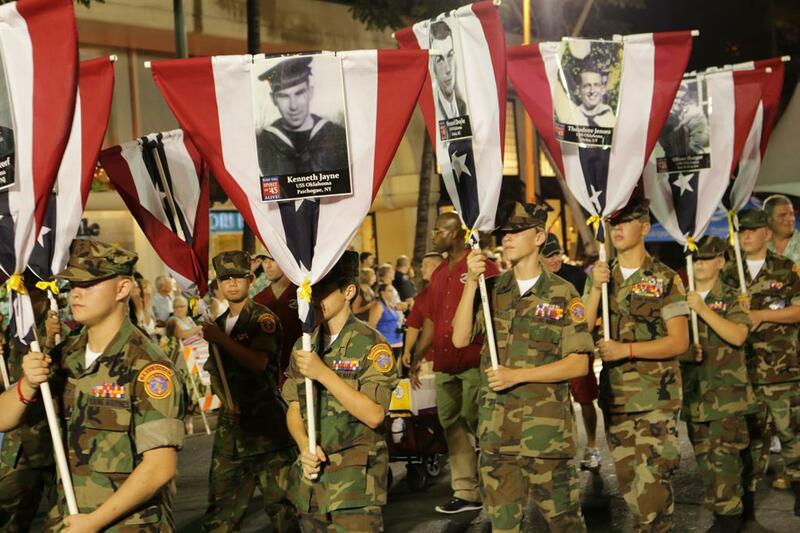 Young Marines honored the fallen of Pearl Harbor by marching in the Parade with individual photos from the Wall. U-Haul supplied a pickup to transport the Kiss to and from the Missouri, and a box truck with the 75th Anniversary logo. 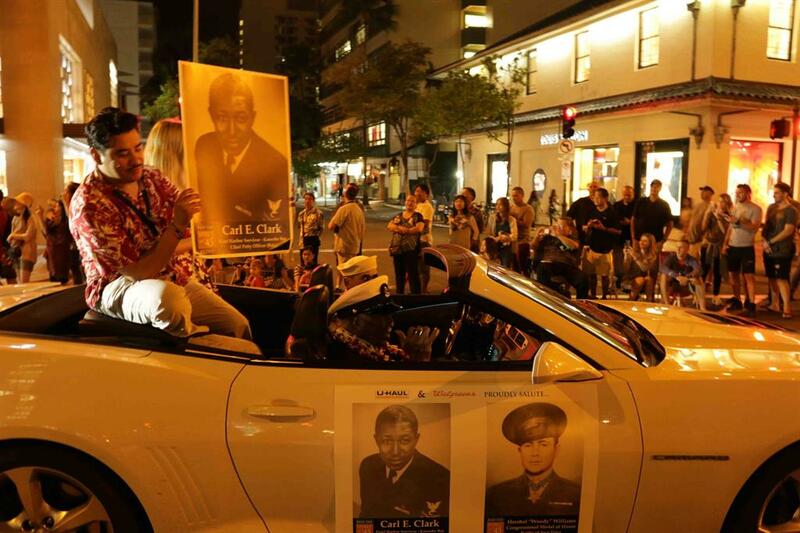 U-Haul also sponsored the convertible that carried Pearl Harbor Survivor Carl Clark, who was accompanied by Robert Corpus on his historic return to Hawaii for the 75th Anniversary. 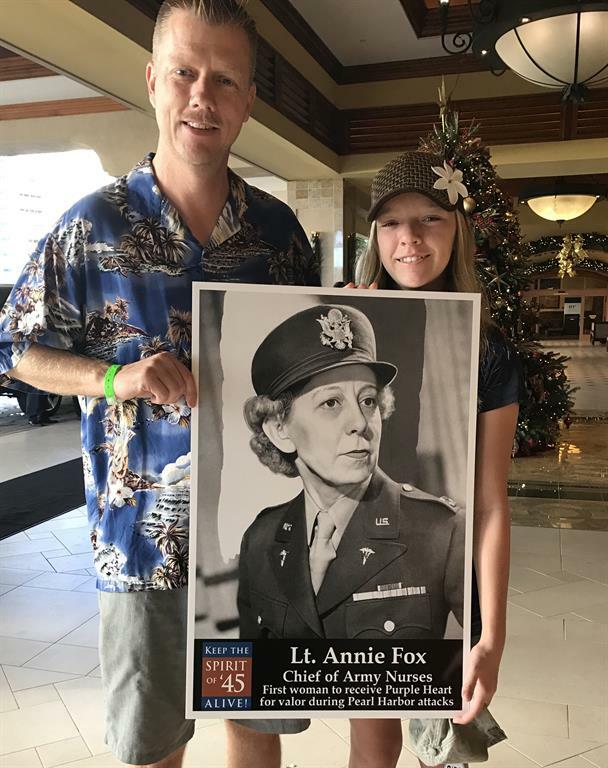 Joining them was Ms. Trinity Hanson from Orange County, CA who helped kick off the Spirit of '45 campaign to honor the Caregivers of WWII by carrying the photo of Lt. Annie Fox, the chief of Army Nurses who was the first woman to receive the Purple Heart for bravery during the attacks of December 7. Thanks to A&E HISTORY and Walgreens for their continuing support for Spirit of '45 Day and the WWII 75th Anniversary Commemorations Alliance! Dwight Hanson and his daughter Trinity with photo of Lt. Annie Fox, first woman to receive the Purple Heart for her bravery during the attack on Pearl Harbor. Walgreens provides the poster photos that youth carry in Spirit of '45 entries in parades on Memorial Day, Veterans Day, and other occasions. 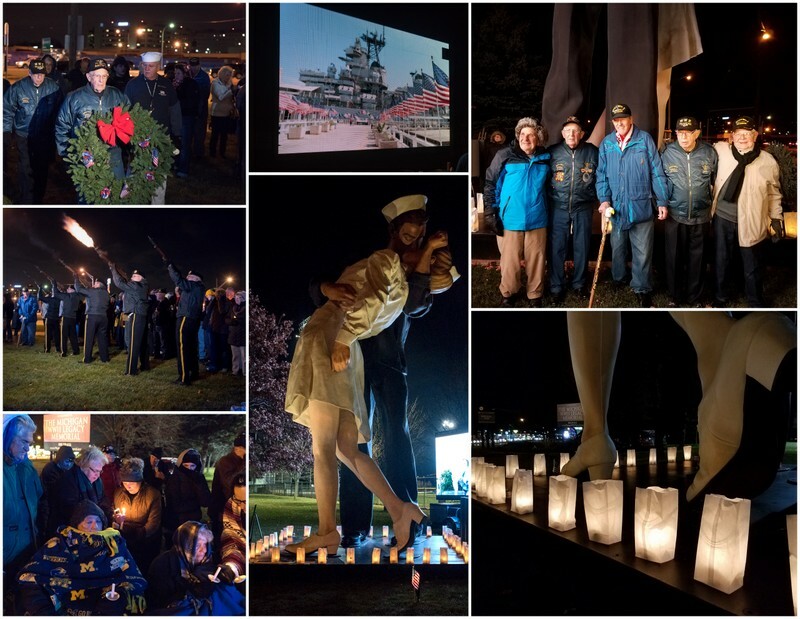 National Candle Lighting: The Spirit of '45 coalition also helped the National Park Service introduce another annual tradition: inviting the public to light a white candle on Pearl Harbor Day submit photos at #Candle75 on Facebook, Twitter and Instagram so they can be posted at www.nps.gov/vair and www.flickr.com/pearlharboranniversary. Learn more.